Most ceiling fans are designed for homeowners and are marketed to be both useful and decorative. 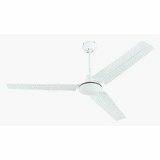 However ceiling fans are also very useful in commercial and industrial settings, where powerful, efficiency, and reliability are often far more important than appearance. Many manufacturers offer ceiling fans specifically tailored to commercial and industrial settings. Industrial/commercial ceiling fans are typically white, brown, or black enamel with 3 metal blades. 56" size is most common, however many manufacturers also offer 48", 36" and 60" sizes. 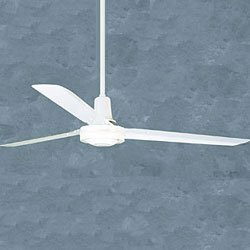 The biggest difference between industrial and residential ceiling fans is that industrial ceiling fans operate with less blades at much faster speeds. This allows for a much greater degree of airflow more efficiently. Curved and/or sculpted blades also create an airflow pattern designed to better circulate larger areas and higher ceilings. Industrial fans usually do not have a switch or speed control attached to the fan body and are designed to be operated from a wall control. Most are not light kit adaptable. So can industrial fans be used in a residential setting? Because of the high speeds and metal blades, industrial fans are not designed to be mounted less than 10 feet from the floor. Some manufacturers offer molded plastic blades as an alternative, these can be mounted on lower ceilings. As mentioned above, they are not decorative and usually do not have the option for a light kit. Also, when used on higher speeds, industrial fans are prone to "wind" noise. With commercial fans is, noise is less of a factor than in residential situations. A 3 blade fan operating at a high speed is often quite noisy-- not a buzz or hum, but the helicopter noise of air moving. The greater number of blades and the slower the speed, the less noisy a fan will be. This is why residential fans (especially smaller models that operate at higher speeds overall) offer as many as 6 blades. This is more of a factor on high speeds than on lower speeds, if you rarely use your fans on high this may not be a factor. So . . . in areas with high ceilings where extra circulation and/or a more powerful fan is needed, and where lighting and aesthetics are not necessary from the fan, industrial fans can be a very good option. Also for areas like covered porches, garages, and workshops, where the fan will be more exposed to the elements, dust, and dirt, and where wood blades may warp, industrial fans provide a much more powerful and efficient alternative to plastic blade "porch fans". Many different companies offer industrial/commercial fans over a drastically varying price range. Inexpensive models can be had for as little as $30, up to over $200 for heavily sealed models designed for agricultural applications. 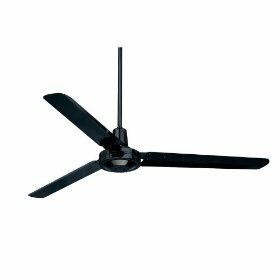 Unlike residential fans, where appearance and brand name are as much factors in price as is performance, with industrial fans essentially you pay more for better quality. The cfm rating is the most important factor in comparing fans, this is the direct measurement of air moved (cubic feet per minute). Industrial fans vary from 20,000 to 40,000 cfm (a quality residential fan will move ~8000 cfm) depending on make and manufacturer. Most manufacturers offer full spec sheets on industrial models for comparison. Some offering quality fans include Emerson, Marley (maker of Leading Edge, Dayton, and Qmark fans) and Envirofan. There are many different speed control options as well, including those that can operate 10 fans or more from one control. Unlike residential fans, most industrial fans can be safely operated by a Solid State variable speed control, however this can still create motor noise in some situations. Some fans include a transformer or capacitor stepped control that provides silent speed selection for individual fans. In industrial and commercial applications, fans are used just as much for heat destratification as for cooling. Most installations have particularly high ceilings and poor heat circulation. Heat rises and so fans are used to recirculate warm are back down to 'people level'. Circulation also speeds evaporation and prevents mold, mildew, and condensation. Due to blade design, industrial fans can be mounted on higher ceilings without requiring long downrod extensions. Most fans include a 12" downrod, some also include optional longer and shorter downrods for varying ceiling heights. For ceilings 40' and higher special blade designs are recommended to ensure floor level circulation.